While drug abuse is well known to trigger mental health problems such as depression, research into illegal drugs has also shown some benefits from a drug known as ketamine. 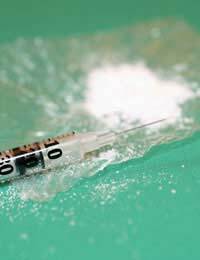 Ketamine is an animal tranquilliser but is more commonly known for its use as a street drug – called 'special K'. A study earlier this year, however, showed that it could rapidly relieve the symptoms of depression in patients, sometimes in as little as only two hours. Not only that, but the drug continued to relieve symptoms for one week. An issue relating to antidepressant therapies is that they usually take some time to show a beneficial effect. Patients can become frustrated or suicidal as they struggle with their depression. In this sense, scientists have been keen to find a treatment for depression that works rapidly. An earlier study eight years ago that only looked at a small number of patients found that severe depression was helped by ketamine. Following on this study, researchers elsewhere began a larger study to find out just how effective ketamine could be in helping depression. Researchers studied people with moderate to severe depression, all of whom had not responded favourably to antidepressant therapies. Initially, participants received either a placebo or a single dose of ketamine. One week later, patients received the opposite dose. For most of the patients, their depression was reduced within only one day. Overall, a fifty percent reduction was seen in the symptoms of depression. For some participants, the positive effects lasted for up to a week or two weeks. While antidepressants typically work to spark brain levels of a chemical called serotonin, ketamine has a different mechanism. Ketamine reduces the impact of a neurotransmitter known as glutamate, which is one reason why scientists think that the drug acts so rapidly to relieve symptoms of depression. This fast-acting aspect of ketamine is one of the reasons researchers are particularly intrigued about the use of ketamine for depression. Unfortunately, there is a very notable downside. One key reason that ketamine is used illegally is because it produces hallucinogenic effects. In fact, this hallucinogenic aspect was the most commonly reported side-effect in the recent study on depressed patients. For ketamine to have any hope of being used therapeutically and legally, it would have to be provided in a form that does not cause hallucinations. Also important is that the hallucinations would have quickly revealed to patients that they received the 'real thing' in the study rather than a placebo. In turn, this may have caused them to think their depression had lifted. Still, the research is important because it gives scientists a starting point for finding a more rapid treatment for depression. For now, researchers are hoping to investigate different ketamine compounds to find one that can provide the therapeutic benefits to severely depressed patients but without the hallucinogenic side-effects that could prove uncomfortable or frightening. Treating depression is vital to improving the moods of the millions of Britons who are thought to suffer from its grip. Hopefully, the recent ketamine research can continue to provide clues to help researchers develop a fast-acting, effective treatment for depression.